Hyundai’s compact Elantra sedan and 5-door get a necessary overhaul and sculpted redesign for 2018 — but it’s the Elantra GT Sport hot hatch with the 6-speed Manual and 201-hp turbo powertrain that’ll set it apart from the competition. As car buyers continue to gravitate towards compact crossovers and small utility vehicles, banishing the good old midsize sedan to near extinction, the compact car market in general is still going strong — with the likes of the Honda Civic, VW Golf, Kia Rio, Ford Focus and so many others — catering to consumers looking for a well-priced, reliable vehicle that offers decent cargo, loads of cabin features and tech, and driving dynamics that go beyond what conventional small cars have been capable of. And, of course, exterior styling and design that screams more sleek and stylish and less I’m-driving-an-affordable-car. Sounds like a tall order, but in this competitive compact sedan and hatchback segment, automakers are staying ahead of the game with each new model refresh or all-new rendition. The only problem now: what do you buy? The affordable Elantra nameplate has been going strong since its introduction back in 1990, entering its 5th-generation for 2018, with several updates and refreshes along the way. Even compared to the outgoing 2017 Elantra, in terms of styling alone, the completely redesigned 2018 Elantra 4-door sedan and new 2018 Elantra GT 5-door hatchback are huge departures. But it’s the latter, in the hatchback version with the 6-speed manual Sport flavour, that elevates the Elantra to new heights with sleeker, more sophisticated curb appeal. And in the compact car and crossover world that’s beginning to offer some strange designs (we know, it’s a personal thing), it’s nice to see more classic, sculpted styling remain in the segment — and not a car chiseled out of granite, by an 8-year old with a butcher’s knife. Gone is the 2017 Elantra’s big, bulky front grill treatment that screamed ‘I’m an affordable car, and I’m ugly.” The European-designed and less invasive grille treatment Hyundai calls the Cascading front grille, which marks a new signature design direction for the Korean automaker going forward. Hyundai, you can call it what you’d like — we just know it looks sharp, stylish, and something younger buyers can drive with confidence. Including me, and I’m not young. With the 5-door Elantra, the long lines run front to back giving it a clean, stretched-out hatchback look. The entire car was tested and designed in Europe, so we can definitely thank the progressive-thinking team overseas for that. And compared to last year’s model, the 2018 Elantra GT sits slightly longer, wider, with a lower roof height for a more planted stance, while keeping the wheelbase the same as 2017. All this adds style and character but also creates additional cargo space as well: going from 651L capacity in 2017 to 705L capacity for 2018 (with seats up). 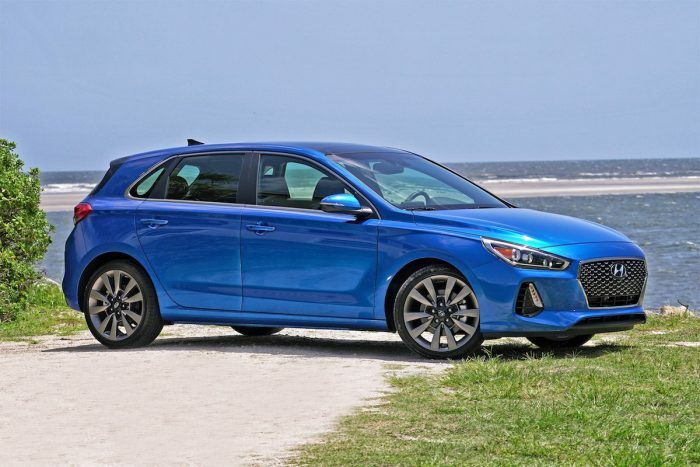 Compared to the competition, including the Honda Civic, Chevy Cruze, Mazda3, Ford Focus, and VW Golf, the 2018 Elantra GT comes out way ahead in terms of capacity and cubic feet. Only the VW Golf comes a close second; the rest of the pack doesn’t. The Elantra GT in the Sport trim rolls on large 18-inch alloys; with large dual exhaust tips in the back and LED headlights up front. Inside, the GT Sport finds leather seating surfaces, and an 8-way power adjustable driver’s seat with lumbar support. This is all in addition to a huge panoramic sunroof, dual automatic temperature controls in the cockpit, and proximity keyless entry with push button start, all equipped with the step-below GLS Manual which rides on the smaller 17-inch wheels. 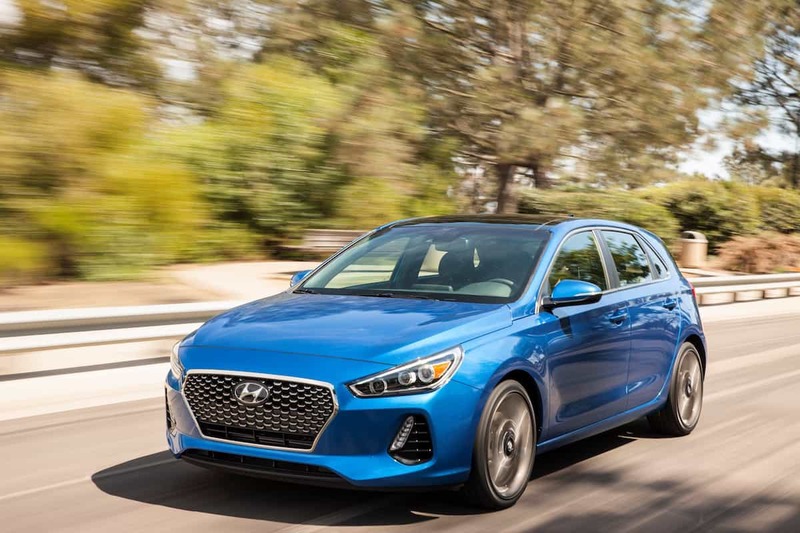 The redesigned Elantra GTs come with a new powertrain under the hood, including a 2.0L GDI four-cylinder making 161-hp and 150 lb-ft. of torque, with the option to go automatic or manual stick-shift. But the Elantra GT Sport gets the more robust powertrain via a 201-hp 1.6L turbocharged GDI with 195 lb-ft. of torque. My tester came with the 6-speed manual transmission while a 7-speed dual clutch automatic with paddle shifters is also available. Personally, I feel when a car literally carries the Sport moniker, it should have some sort of sport drive mode that alters the driving dynamics (i.e. stiffening the suspension), and not simply slapping on an aero package or big, sporty wheels (which fortunately, the Elantra GT doesn’t do). But I digress. While the Elantra GT Sport certainly handles well on the city roads and highway drives, backed by respectable power at 201-hp in a compact car, this certainly isn’t a Ford Focus RS — nor should it be. For everyday (youthful) drivers, the GT Sport provides reasonable performance and handling that’ll take this car beyond the typical hatchback on the market. Add the 6-speed stick shift in the mix for a more spirited drive, and you’re in business. If you keep your sport expectations in check behind the wheel of the 2018 Elantra GT Sport, you won’t be disappointed. And keep in mind, Hyundai tested and developed the Elantra GT on the Nürburgring Nordschleife in Germany, running hundreds of laps. The engineers tested for ride, handling, and durability resulting in a suspension tune that feels taut yet comfortable, minimizing unwanted body roll yet maximizing wheel impact absorption. Up front and centre is a new floating-style display head unit equipped standard with an 8-inch screen; optional is an Infinity Premium Audio with ClariFi, Apple CarPlay & Android Auto, and wireless smartphone charging. The door lock button is located in the centre stack which was kind of inconvenient when I needed it, but maybe it’s there for a good reason. Heated seats and leather-wrapped heated steering wheel comes a standards up North. Unlike the other Elantra models, the GT Sport gets a more race-inspired cabin with nice red-black contrast throughout; including exclusive red stitching details, red seat belts, and detailed red piping on the bolstered leather seats. Also new for 2018 is the BlueLink telematics system (and Hyundai first in Canada). Essentially, this app or browser-based technology that allows you to communicate with your vehicle remotely, to do things like lock/unlock doors, start the car, get the heated steering wheel going, maintenance reports that mechanics will find handy, etc. Every automaker calls it something different for their own brand (Kia’s new UVO Intelligence, Ford Pass, etc. ), but we’re seeing more of this remote tech being introduced in vehicles today — something that should sit well with the younger demographics with their reliance on mobile devices. When the competition heats up, it’s time to step things up. Hyundai has certainly done this with their completely redesigned 2018 Elantra GT compact, adding more interior space and cargo, more technology for today’s consumer, and two new powertrains under the hood. While the 4-door sedan model hold its own, it’s the 5-door Elantra GT Sport that really separates this car from the competition, in terms of exterior styling, the exclusive red-black interior treatment, and the more robust 201-hp 1.6L turbo engine found at this trim level. End of the day, you can’t really go wrong with a sport hot hatch that offers this much at for under $30,000 US/CAD.